After being reported to the ICO (Information Commissioners Office) – Shield Security have confirmed they destroyed, deleted all of the personal data requested, even after they had been informed well in advance that it was required. They also destroyed a sworn statement dated 29th June 2010, written for residents and put on the notice board at 8 Queens Road. Copy is still available. If you can’t see it, then it doesn’t exist and can’t be true can it!? Can you trust Shield Security with the truth, your personal data, your safety or to work with people? Shield Security are recording and logging data on residents at 8 / 8A / 8B / 8C and 8D Queens Road. It is believed they are providing this to undisclosed third parties. Shield Security have gained access to ALL these properties and are prepared to enter individual rooms without giving residents any Notice, to remove personal belongings. Residents reported men walking around the properties at 8 Queens Road and trying to gain access to the house. They pushed past a resident to get in, used THREATENING BEHAVIOUR and refused to identify themselves or leave. The ring leader failed to identify himself, I am led to believe that his name is ‘John Annetts’. ‘Shield Security’ were there to provide intimidation, force and security for this man John Annetts. The manager of Shield Security turned his ID name badge round when asked to identify himself, his signature was legible as ‘Heppleston’. Is this not how criminals would behave? Are these the actions of legitimate business people? Entry was refused by the owner and the residents at the property. They had already used harassment, tried to intimidate the residents and said they were ready to use force to gain entry (through hired thugs from Shield Security to deal with anyone that got in their way and a locksmith to force his way into the property). (b)the person using or threatening the violence knows that that is the case. The Police were called and ‘John’ told everyone present (including tenants, witnesses, Shield Security staff and Police) that he worked for the Bank of Scotland. No Notice was given of their visit or actions and no documentation has been provided by these parties to prove who they are working for, despite being requested in writing. John Annetts told the Police that the letter he had was witnessed by a solicitor. When I asked him to repeat this, he confirmed it was witnessed and signed by a solicitor. The photocopied signature was a poor photocopy of a fax, with Bank of Scotland header and the signature he referred to was apparently that of Laura Falconer, an employee of BofS. It is believed that Laura Falconer is not a solicitor or lawyer. John LIED to everyone stating he had a document witnessed by a solicitor, it was actually a photocopy of a document probably provided by his friend/associate Kevin Oliver. John was asked to provide certified copies of any contracts or documents that he had, he didn’t have any. When asked if he could provide a certified copy, he said it was not possible and said it would take time (nothing has been received since). When the Police asked if he wanted to serve any papers or Notice on the owner, he declined. The male Police officer, PC 2250, Gavin Connor made a Judgement that John was in the right, without seeing or providing ANY evidence, except a photocopy of a piece of paper dated in March 2010 – that wasn’t signed by the courts, judge or solicitor. The female Police officer, PC 6664, Shelley Harrison threatened and joked about tasering the owner as he was on the phone to his solicitor. The Police were unprofessional and probably have not been trained properly – this matter will be addressed separately. Entry was refused by the owner and the residents at the property. Police officers assisted them in gaining entry. The Police, having assisted John Annetts, allowed them to enter the property. John’s assistant BROKE the lock on the main door and replaced it. As they changed the locks to the front door – John Annetts told the Police and residents that they would be given keys – this was another lie as he had no intention to do this but to physically take control of the property with Shield Security. John Annetts had lied again to residents and Police, in front of witnesses. They then BROKE & ENTERED into the caretaker’s office and took control of the keys for the properties at 8/8A/8B/8C/8D Queens Road and the CCTV cameras, that are there for the protection of the property and the residents – not unknown third parties to be collecting data and information. John’s associate broke and entered into rooms at 8 Queens Road. Locks were changed on rooms without having given any notice or informing anybody of their actions. John told a lady and her daughters moving into 8B Queens Road, that she would lose her home if she did not leave. It is believed that the conversation he had with her was also backed up by Paul Twomey (Bank of Scotland solicitor). Having been threatened with eviction of herself and her family, out of a house she had just moved into – she was frightened and left because of the legal threats of John Annetts and Paul Twomey. John Annetts did not leave a postal address or landline telephone number to contact him on. The first thing Shield Security did was remove a sworn affidavit from the notice board in the property (stating who the owner was and the exceptional circumstances and actions of Bank agents) as they were now in control of what people could see, be told and their ‘truth’ of the matter. A real and professional business would not break into property, would not take action without first giving notice, would provide documentation when requested before continuing, would not tell outright lies and be dishonest. Shield Security have taken over the house and the owner has not given them permission or consented to them being there in any way, shape or form. Shield Security have failed to be civil and professional about the matter. They have failed to provide any documentation as evidence that would lawfully allow you to be there and continue their, what we believe to be illegal and unlawful occupancy. Since then, their employees, have told us that they work for the Bank, as led to believe by John Annetts. They have intimidated and harassed residents, under who’s orders no-one knows. Shield Security have harassed people, followed them round, left them waiting outside, and been verbally abusive and aggressive. Shield Security have been logging data and recording the movements of residents and we believe providing this information to undisclosed third parties. Residents have been ASSAULTED by their employee Waqaas Majid, who Peter Heppleston supports in his actions. Peter Heppleston has refused to provide the CCTV footage! Waqaas Majid has THREATENED residents and claims he only answers to God and has told residents it is ‘not their house’. This has been reported to The Security Industry Authority (SIA) but they have failed to respond. Shield Security have LOCKED the mailbox at 8 Queens Road. If people behaved like this in your house with people that you know, would you find it acceptable? Shield Security have failed to provide certified copies of any documents, Notices, Orders or Contracts regarding who they work for or that allow them to be at the property. Shield Security have failed to acknowledge the Human Rights of the residents and educate their employees. Since the assault they have referred to a private email, between what can be considered to be a bunch of criminals, as it is not a legal Notice. Personal data has been formally requested, that Shield Security have been collecting and they have failed to provide it. It appears that they do not think Human Rights and Data Protection Laws apply to them and their associates. After being Assaulted, residents have now been forced to carry cameras and recording devices to protect themselves. They are interfering with people living in this property and also tampering with mail, as they have locked the letterbox so no-one can check their mail. 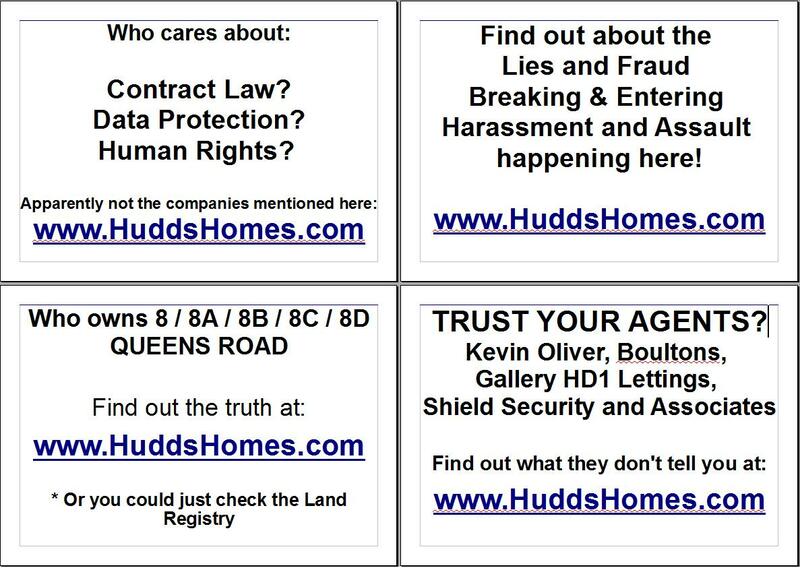 John Annetts and Shield Security are NOT Agents of the Landlord and do NOT represent him in any way, shape or form. He assaulted a resident and the Police were called. The Police viewed the CCTV and told him that he was seen assaulting the security guy (!? ), as he had used the back of his hand to push him back to keep his distance whilst the police arrived. Even though Shield Security were unable to provide any contracts or orders to show why they were on the property – and the security man had been aggressive, abusive, pushed the person around, followed him to a blind spot on the CCTV (a common trick of violent security staff) and threatened to rip out his throat. When asked to keep his distance, he kept pushing forward so close that his beard was in the face of the person being assaulted and close enough for his behaviour to continue being aggressive and threatening. It is believed that because he has a badge he thinks he is above the law. This can all be seen on the CCTV footage that Shield Security have failed to provide. Sunday 6th February 2011: Shield Security broke and entered into a room that was occupied to remove notices informing the public of what is happening at 8 Queens Road. The Notices were placed on Saturday evening, the night before – and stated that you should check this website. Here are the Notices that they don’t want the PUBLIC, you, to see! The tenancy for that room is on file and available to law enforcement and Press to examine. They had no right to go in this person’s room – but clearly the law does not apply to Shield Security, Agents of John Annetts (associate of Kevin Oliver) who is working for the Bank of Scotland! See some videos of Shield Security harassing and assaulting residents. This Security officer decided he can do what he wants to people in the house and physically control their movements. Shield Security have refused to provide CCTV footage of the attack. Since the unexpected assault, residents have been forced to carry recording equipment to try and protect themselves. The same Security officer interfering with residents, telling them what he thinks and being aggressive and harassing them in their home. What is is Terrorism? The systematic use of terror as a means of coercion. To terrorise people living in their home, into being controlled and intimidated into leaving. Shield Security terrorised people, caused damage to property and were ordered by Kevin Oliver who was hired and paid by Laura Falconer at the Bank of Scotland to act covertly for the Bank! More videos, audio, pictures and documents available to show how the Bank of Scotland agents behave and failure of Bank of Scotland to deal with the matter. ALL the above has been done with the 'blessing' via funding and knowledge of Lloyds TSB Halifax Bank of Scotland CEO Antonio Osorio and the SIA Who have failed to acknowledge the criminal activities and behaviour taking place by the Bank's representatives and Agents. The Ombudsman also refused to comment on their behaviour as well. To know about it, then ignore it, is to condone it! Don't be suprised if they are ignorant or evasive! "Banks bring Terror to Huddersfield"
"How Bank of Scotland abuses the Legal System for control"
"FACTual Evidence versus Legal Fiction - can you trust a lawyer to know and tell the Truth?" "Who does Kevin Oliver of Hexham tell people he works for and who really gives him orders and pays him?" "How Courts work for money not Justice"
Are Police Officers paid to Protect the Public or take the side of Banks regardless of evidence?